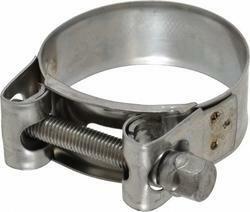 Pioneers in the industry, we offer industrial hose clamps from India. In order to meet the variegated demands of the clients, we have come up with a wide range of Industrial Hose Clamps. Extensively used in heavy pressure withstanding applications such as in the irrigation and farming areas, our range is manufactured in accordance with the industry set quality norms. Our offered range of unitary clamps is stringently examined before being dispatched in the market.